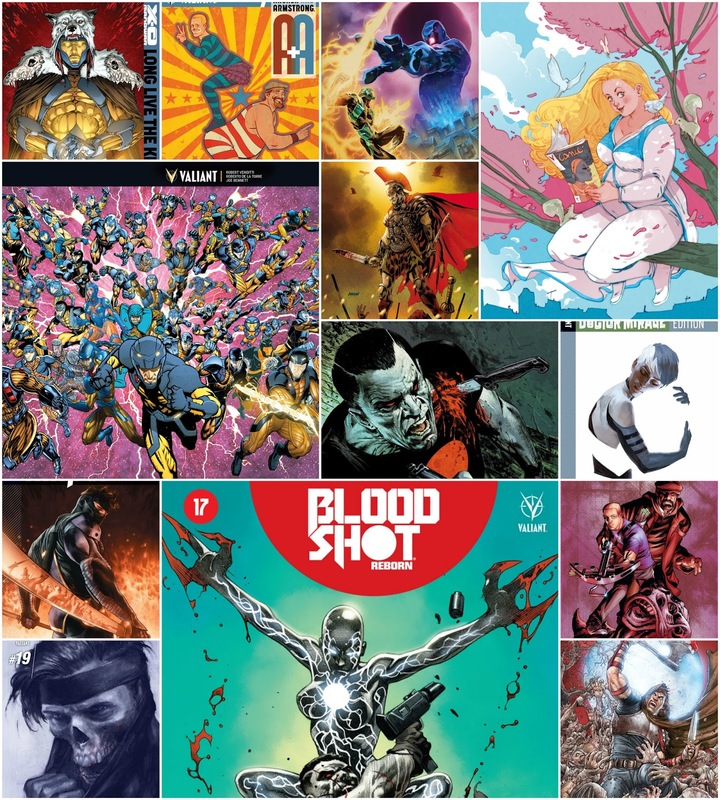 Valiant is shipping some incredible books in September. Take a look at the solicitations for the upcoming month beginning with the 50th issue of X-O Manowar. It's oversized with 64 pages of star-studded stories and art fit for a grand series finale. Check out all the fantastic variant covers. Also, welcome "The Future of Valiant" with new titles Britannia #1, Generation Zero #1, and of course Valiant's newest superstar Faith as her miniseries gets an on-going. Happy reading! From all corners, the Valiant Universe assembles to salute X-O Manowar’s unparalleled 56-issue run as Robert Venditti, Joe Bennett, and Roberto de la Torre declare “LONG LIVE THE KING” with an oversized series finale for the ages! Plus: all-new, never-before-seen X-O Manowar tales and tributes from Jody Houser & Javier Pulido, Matt Kindt &Tomas Giorello, and Philip Tan, and special guest appearances from X-O Manowar’s own Cary Nord, Diego Bernard, Rafa Sandoval, Robert Gill, and more! Mild-mannered blogger by day. L.A.’s leading superhero by night. Faith Herbert – aka the high-flying hero called Zephyr – has come a long way since she first set foot in the City of Angels. But nothing can prepare her for the pinnacle of all her experiences to date: California’s biggest comic book convention! But even amidst a sea of fellow fans, cosplayers, and collectibles, crime waits for no man! With thousands watching and even more at stake, can Faith prevent all-pandemonium – and preserve her secret identity – when the fun turns to frenzy? Find out here as breakout star Jody Houser (DC Young Animal’s Mother Panic) and acclaimed artist Pere Perez (ARCHER & ARMSTRONG) and Marguerite Sauvage (DC Comics Bombshells) launch the most talked-about new series of 2016 to astonishing new heights! THE FIST & THE STEEL fight onward! Riddled with an uncanny disease in the present, Colin King has seen what the future holds – and it is death! Decades from today, destruction looms…and Ninjak and the Eternal Warrior will be our only hope! But even after years on the battlefield, are these weathered veterans still strong enough to forestall an evil that now threatens all of humanity? Glimpse the future of Valiant’s two most dangerous men here as Ninjak and the Eternal Warrior baptize their formative partnership in the blood of many men! And meanwhile, back in the modern day, Ninjak must exhaust every resource at his disposal to find a cure for the mysterious, Deadside-spawned affliction that continues to destroy his body… But the clock is ticking fast and each step that MI-6's master super-spy takes brings him one step closer to the grave! New York Times best-selling writer Matt Kindt (4001 A.D.) and explosive artists Khari Evans (HARBINGER) and Andres Guinaldo (Justice League Dark) collide today against tomorrow for THE FIST & THE STEEL's next 40-page showdown! ALL-NEW ARC! ALL-NEW JUMPING-ON POINT! Valiant’s immortal master of war makes A DEAL WITH A DEVIL! New York Times best-selling writer Robert Venditti (Hal Jordan & The Green Lantern Corps) and acclaimed artist Robert Gill (BOOK OF DEATH) push the Eternal Warrior to the fiery crossroads of guilt and redemption for a wicked new jumping-on point as A DEAL WITH A DEVIL takes hold! The hunt for Armstrong’s estranged wife is taking a strange turn through America’s most bizarre traveling circus...and it’s no laughing matter! Besieged by a deranged troupe of malformed Armstrong clones, the world’s hardest-traveling adventurers may have finally met a match more dysfunctional than they are! And if that wasn’t enough absurdity for one day, a Russian science bear is about to come barreling through the big top with grave news for Archer & Armstrong! Trapped in a remote jungle paradise with no hope of escape, Bloodshot has discovered the secret behind the merciless technological monstrosity called Deathmate – and the truth has thrown his entire world into a tailspin of tragedy! But what revelations behind Project Rising Spirit’s horrific creation could bring even Bloodshot to his knees...and forever shatter the spirit of the man known as Ray Garrison?